Two plants discharged up to 2,000 cubic meters of water a second. Water discharged from hydropower dams during heavy rains in Ha Tinh Province over the past two days has been blamed for escalating the flooding that has submerged thousands of houses in the area. Dang Quoc Khanh, the provincial mayor, said water released from hydropower dams on Friday night had caused water levels to rise quickly and no one was able to handle the situation. “You cannot just discharge so much water that fast,” Khanh said during a visit to affected areas on Saturday morning. “The dam operators should have informed locals properly in advance,” he said, as cited by news website VietNamNet. A report from the provincial Irrigation Department said the Ho Ho hydropower plant discharged between 500-1,800 cubic meters a second on Friday night, while the Boc Nguyen plant discharged 150-200 cubic meters per second. More than 5,000 houses downstream were submerged by Friday afternoon, some by four meters. 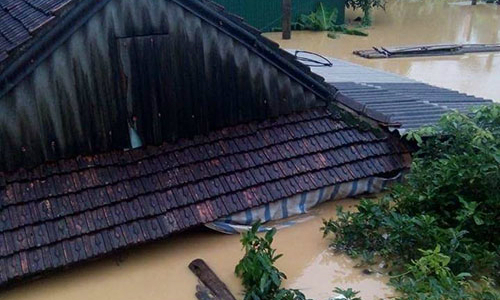 Around 27,000 houses in neighboring Quang Binh Province to the south are also deep in water. A low tropical pressure system made landfall in Quang Binh on Thursday, bringing torrential rains of up to 700 mm, in what was described by many as one the worst disasters to hit the province. The floods have left 8 people dead and 10 others missing. At least six people in Quang Binh have been killed and six others reported missing. Dozens of boats sank or went missing offshore in affected provinces. The non-stop rains also paralyzed important roads in Quang Binh, holding up thousands of trucks and 43 trains on Saturday morning. No response has been made by the dams' investors, and it is not the first time hydropower plants have been blamed for flooding in Vietnam. In 2009, the A Vuong hydropower dam in the central province of Quang Nam released 150 million cubic meters of water during Storm Ketsana, worsening flooding that killed at least 163 people and caused over $786 million worth of damage. In 2013, water discharged from nine hydropower dams was blamed for worsening flooding triggered by a tropical depression that killed 41 in the central region, which has the most hydropower dam projects in Vietnam. A government resolution imposes fines of VND25-30 million ($1,120-1,350) on hydropower investors for discharging water without a proper heads-up, but victims say the fine is too small to change anything.